FIL-American Maverick Ahanmisi is eyeing the same destination as fellow Big Ten Conference alumnus Stanley Pringle, only he looks set to get there quicker. After helping University of Minnesota win the National Invitational Tournament this year, Ahanmisi is now seeing action in the D-League and should be eligible for the next PBA rookie draft. 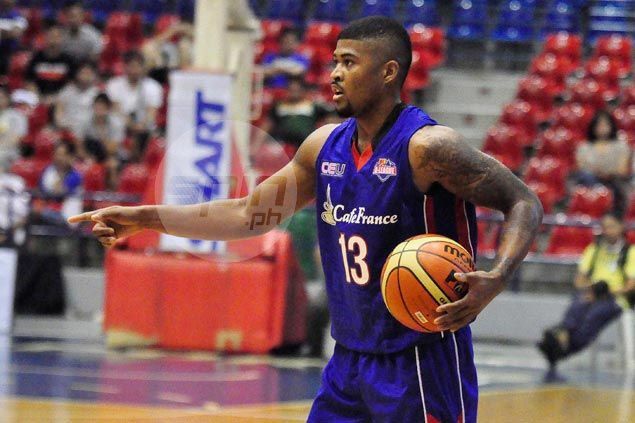 The 23-year-old Ahanmisi made his debut in the Philippines with Café France on Monday in the PBA D-League. The 6-foot point guard scored 11 points, 10 in the first quarter, in 18 minutes of play as the Bakers defeated MP Hotel. Ahanmisi was part of the Minnesota Golden Gophers squad that won the NIT title. The Gophers are coached by Richard Pitino, son of legendary college coach Rick Pitino of Louisville. Now the Fil-Am guard, whose mother traces her roots to Alcala, Pangasinan, hopes to follow Pringle, who was made the 2014 top pick overall by Globalport. Pringle played for Penn State in the Big Ten Conference but played in other leagues including the Asean Basketball League (ABL), before moving to the PBA. “We came from the same conference. I’ve been watching him since high school. I like his style. He is the guy that I look up too. Hopefully, I end up playing like him and try to mold myself to becoming as good as he is,” said Ahanmisi. Ahanmisi could have tried playing elsewhere, but took the chance in the Philippines and learned on Day One in the D-League about the physicality in the local game. He said it suits him fine. “I’ve been hearing about the PBA my whole college career. I decided to take the opportunity. I know basketball is really big out here so I just grabbed the opportunity of playing in this league,” said Ahanmisi. “It was fun. Playing in the Philippines is something new. Just the physicality here, you get to play scrappier defense. It fits my game,” said Ahanmisi. Café France coach Egay Macaraya said there is no question Ahanmisi is a fine player. “He is a very good player. Hindi siya kilala because he is playing in the States. No question about him. He is playing (sa) first five so (that means) he is a good player,” said Macaraya. Ahanmisi also said playing under the younger Pitino helped him become a better defensive player. “He helped me a lot especially on defense and basketball in general. He has a great mind. He helped me especially in the point guard position, just being a leader on the court and helping my teammates. He made it clear his focus is with Café France, and that he is not setting a timetable on entering the PBA draft. “Right now, I’m focusing on just helping the team win games. My ultimate goal is the PBA, but right now, I’m focused on winning games,” said Ahanmisi.